OR tap the share icon at bottom left of screen. - Select "What's My Note? - Import" from the list. To hear a note, press and hold it. To hear an interval, drag between the notes. To hear a melody, drag across the notes from left to right. To zoom to a particular position on the page, double-tap at that position. Double-tap again to return to the full page view. This option allows you to see what note is currently playing. The track bubble can be activated or hidden from a checkbox on the menu. The Replay Panel allows you to record the notes you play, and then play back the recording. To record a passage that spans more than one page, record the start of the passage, pause the recording, move to the new position, then resume recording. The Replay Panel can be activated or hidden from a checkbox on the menu. To configure how What's My Note? reads music, selected Settings from the menu. Octave issues arise because vocal music is often sung an octave higher or lower than written. 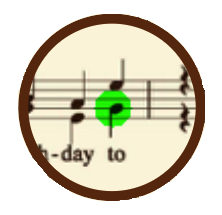 This may be indicated by an "8" attached to the clef, but most often, it is not explicitly notated. Hence, the need for a setting. Play treble clef an octave lower than written. Select this option if you are a tenor. Play bass clef an octave higher than written. Select this option if you sing bass in a women's barbershop quartet. 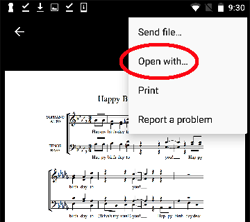 When the music does not contain clefs, a default clef can be selected from the bottom row of the Settings View. To enter the Music Library, select it from the menu. Here you can view a list of all music you have entered into What's My Note? and choose a particular page to view and play. 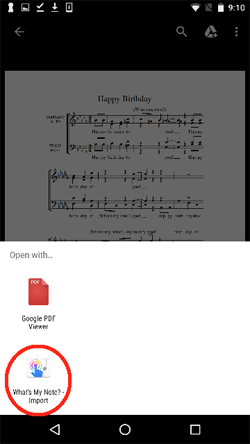 To assign a name to a page of music, tap the title above the music view. You cannot export music from What's My Note? to others' devices because to do so could be a violation of copyright.